Today, Jason is joined on the LAUNCH Festival stage by Shervin Pishevar and Brogan BamBrogan, Co-founders of Hyperloop Technologies. The Hyperloop is happening and we learn all about it! How it works, costs, location, government support (here and abroad), infrastructure, potential affects of the current Presidential race, the nature of ‘new cities’ and all the incredible innovation surrounding it. Brogan gives a great explanation of the technology behind Hyperloop; if you’re not familiar with it, it will in fact be a levitating pod inside a tube, powered by electromagnets and taking advantage of reduced air resistance to travel at extremely fast speeds. It’s not magic, but it’s probably going to look like it. Several times, both Brogan and Shervin underscore the fact that the technology to build Hyperloop currently exists – the goal at Hyperloop Technologies as a company is to make the Hyperloop cost effective. They assert that if the Hyperloop isn’t cost effective, it won’t be as revolutionary as they know it can be. You might be surprised to learn that Hyperloop Technologies will run their first tests by the end of 2016. The team has been hard at work since signing a lease for their Nevada test site in December, and will have over three miles of tube and rails on which to run Hyperloop pods. Jason asks Shervin about the cost of bring Hyperloop from idea to reality, and he gives some insight: their first round of funding was for $11 million, and their next round target is $70 million to fund the test runs in Nevada. Brogan also estimates that a San Francisco to Los Angeles rout will cost between $15 and $20 billion. At the same time, these estimates are taking advantage of cost effective innovations. Hyperloop May Be Abroad Before it is in the U.S.
Shervin and Brogan give insights into how there are countries all over the world are interested in adding Hyperloop technology, and many of them will create regulatory opportunities faster than the U.S. Shervin also ends the conversation discussing how the winner of this presidential race will affect how quickly the U.S. will adopt Hyperloop transport. Jason asks Shervin about how Hyperloop will disrupt the aviation industry, and he gives a measured answer: short-term transport will definitely be affected, but initially long-term air travel will not be impacted. You’ll still be able to fly cross-country, if you love those tiny airplane seats. While Brogan points out that the technology currently exists to build a Hyperloop route from Long Beach to Shenzhen or Shanghai. The big hurdle that Hyperloop Technologies is trying to overcome is in creating the most cost effective way to create that route. By the end of our lifetimes though, it will be a real possibility. While SpaceX hosed the Pod design and build competition in 2015, this was just one part of what Shervin calls the Hyperloop “movement.” He talk about how much the support the idea has, and how Hyperloop Technologies is just one company helping support and make the technology a reality. 0:54 – 4:31: Jason introduces Shervin & Brogan from Hyperloop, and asks Brogan about the origins of Elon and his Hyperloop idea. Shervin gives additional insights. 4:31 – 7:03: Jason asks Brogan about the technology of how Hyperloop works. 9:30 – 11:24: Brogan continues to explain about the technology of how Hyperloop works. 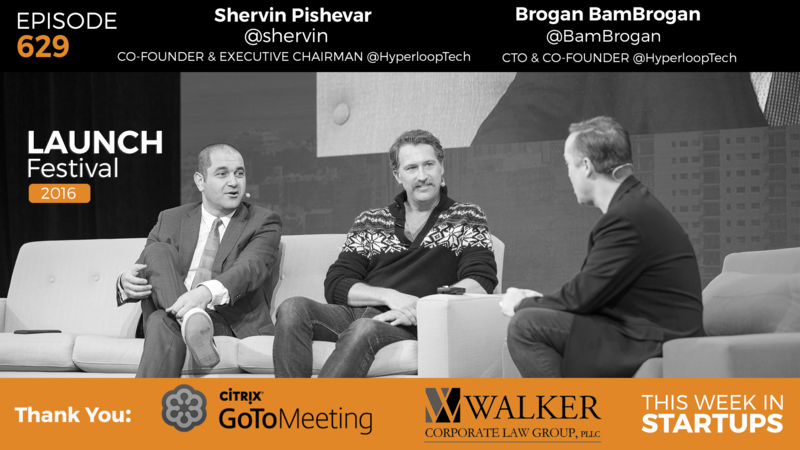 11:24 – 13:11: Shervin and Brogan talk about the level of innovation at Hyperloop, and the costs of production and use. 13:11 – 15:05: Jason, Shervin, and Brogan discuss the test track set to go into operations later in 2016, and the Pod Competition in 2015. 15:05 – 16:18: Jason asks Shervin about the first estimated dates for cargo and passengers transit. 16:18 – 19:33: Shervin gives insight into the capital intensiveness of the Hyperloop project. 21:15 – 23:58: Jason inquires about the government response to Hyperloop – both domestically, and internationally. 23:58 – 25:51: Brogan and Shervin talk about the technology of putting the Hyperloop through mountains and underwater. 25:51 – 27:10: Jason follows up asking about long-distance underwater Hyperloop capabilities. 31:24 – 32:34: Brogan gives insights into where Hyperloop will be in terms of ‘right of ways’. 32:34 – 34:13: Shervin talks about the hurdles to getting Hyperloop established in the U.S. first. 34:13 – 36:25: Jason asks about the likely first routes for passenger and cargo Hyperloop transport in the U.S.
36:36 – 37:34: Jason asks Shervin about what he predicts Obama will do after ending his presidency. 37:34 – 40:27: Shervin gives his insight and expert opinion on the presidential race, why he’s supporting Hillary Clinton, and why we should fear Donald Trump becoming president.